Shadowing to or from multi-monitor desktops is broken in Windows Server 2008 R2, which means Citrix XenApp 6.x. 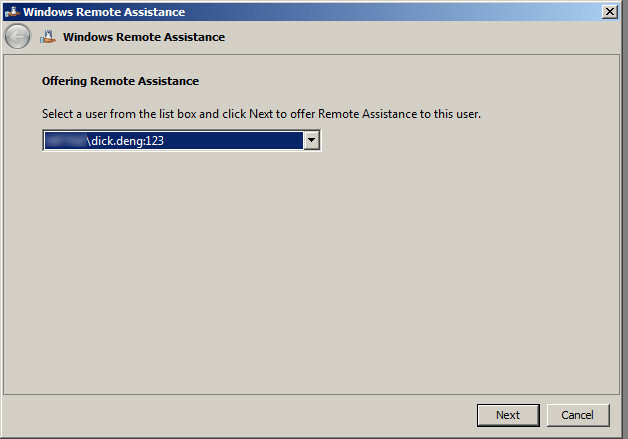 Nothing new here, I read about this on Joshua Mueller’s blog about a year ago, and Citrix also has an article based on explaining how to use Microsoft Remote Assistance as alternative shadowing method. 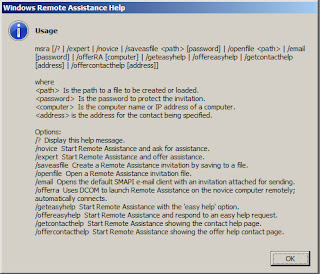 While RA is a good alternative the problem is that there is no integration with the XenApp farm; a support person must find the user session within the XenApp console, find the XenApp server the session is on, open RA using msra.exe /offerra, enter the server name and finally select the user session from the drop-down list. Phew. A few too many steps for support staff who do this day-in day-out. Surely there must be a better way! There is, but it’s not perfect either. I had some fun using Sapien PrimalForms CE to create a PowerShell GUI which helps automate the task of finding a XenApp user session and shadowing the user via Remote Assistance. 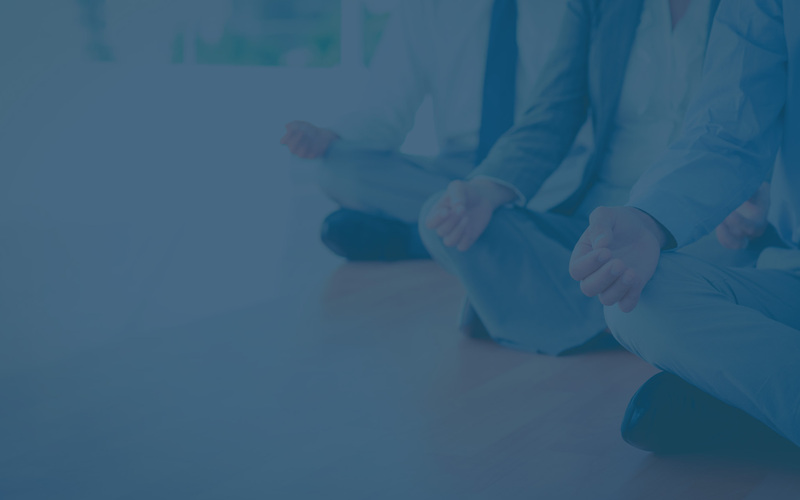 To find the free version of PrimalForms go to downloads, sign up, and look in the Community Tools section for the free download. 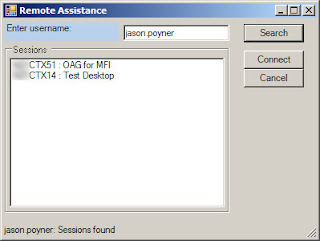 Select a session, hit Connect and Remote Assistance will open and connect to the XenApp server. Select the user from the drop-down list and click Next to shadow the session. 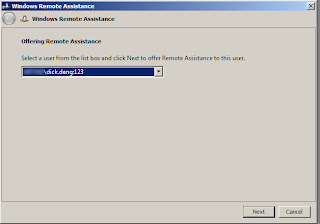 So this Remote Assistance GUI is helpful, but far from perfect. 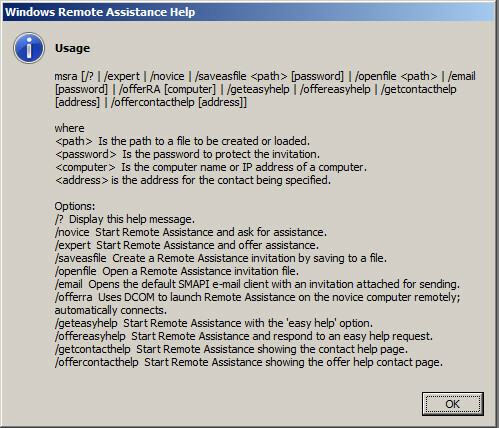 Please let me know if you find it useful, would like it modified, or know of another way of invoking a Remote Assistance session where the username can be parsed. Could you please provide the PrimalForms (.pff) project file too? Parsing to the user with msra seems to be impossible but this script i good enough i think. Could you send me the .pff file? I would appreciate that very much. That is great Jason, nice work. It is possible to get the project file as I would like to change the size of the blue window slightly as I want to add some extra wording in there. + Write-Host (“Selected session: ” + $serverSessions[$selectedSession]. The code in the error is called when you click Connect, not when you click Search. Can you confirm what you are doing when this error occurs? I was getting the same error message. It was a scope issue. I changed all references of $serverSessions to $script:serverSessions and the Connect button worked. Which Permissions (for support Personal) are needed to find any sessions? I believe View Only rights should be sufficient within XenApp. Is this the only way to publish the script? is there a way to push it without pointing it to a network share? You can place the script where ever you want. I recommend a network share so that you have a single central copy of the script. But you can put a copy on several XenApp servers if you wish. Great script. I want to give my helpdesk users this nifty tool but my helpdesk users don’t see any ICA sessions, only RDP sessions while administrator user see all sessions. helpdesk user doesn’t get any result. Do your helpdesk users have at least view rights to the XenApp farm? Hi Jason, great work but we are also having the same issue whereby it only seems to enumerate the users if you are a Full Citrix admin, the helpdesk who have full read rights, plus some extra bits, can’t seem to search for the users, any ideas? Wow very clever idea. Thanks for sharing! Got the script working great, but would like to add a request. Can you add the functionality to KILL the users session? That would make this a perfect help desk tool. .Do you have the correct permissions on the remote computer? .Is the remote computer turned on, and is it connected to the network? .Is there a network problem? all the above check are good, still unable to use remote assistance. please advice. If you still get the issue then RA is not set up correctly. You’ll need to get RA working before the script can be used.